A spin-off from my long interest in the Boer War, or the South Africa War as it's being called more and more nowadays, is that whenever I travel in South Africa I can use my imagination to try to match events of a hundred and ten years ago with what I'm seeing and experiencing. One of my favourite spots was Fort Klapperkop while I was doing National Service in the nineteen sixties. As a photographic unit we were required to visit the fort that was being restored and compile a photographic record of the process. I came to know the site well, and for a few years after leaving the army I was repeatedly drawn back, to sit on the hill and gaze across Pretoria, imagining the events of 1900. I fell into a similar mood in the Brandwater Basin in the Eastern Free State recently. It was new territory for me, and I did what I could to find places I'd read about. I went back to the books and read about Surrender Hill where Generaal Prinsloo surrendered to the British Army with about 4000 burghers after Christiaan de Wet and President Steyn had just managed to escape through a pass the Brits had failed to close. Julie Andres sang "The hills are alive....." in the Sound of Music, and I found these hills alive with hardened, bearded men on their sturdy ponies, nursing their wagons and teams of oxen over hills and through valleys and streams as they struck camp to flee yet again from the more orderly but less adept British troops. I felt the presence of the retainers and servants, tribesmen who'd gone to war with their masters, and who'd paid as high a price as any for being part of it. 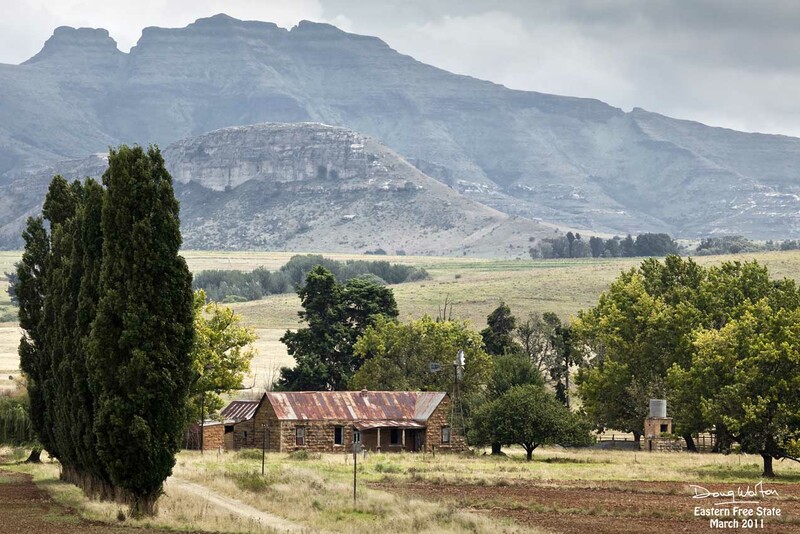 Steyn and de Wet had eluded the foe, exiting the enormous valley via the Naauwpoort Nek, leaving the dispirited and weary Free State army to its fate, which turned out to be a meek surrender. Only some twelve years later were two farms purchased to establish a new town at the foot of the Nek. 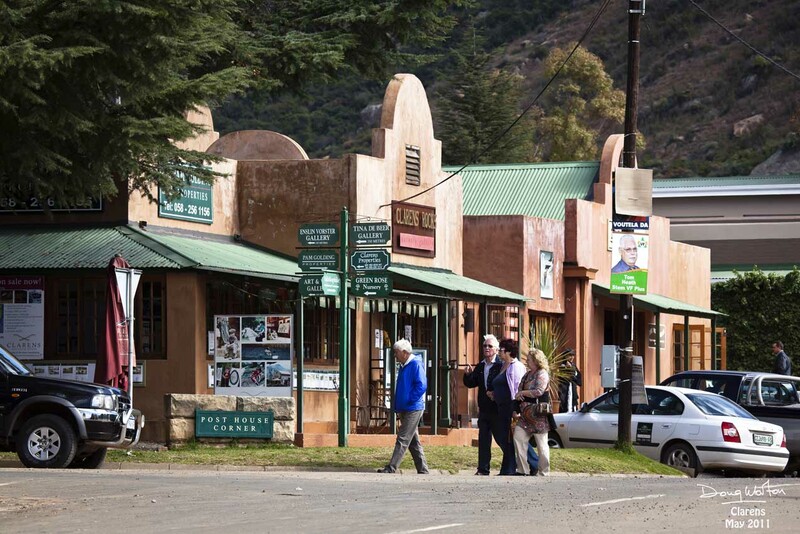 There was considerable debate about the name of the proposed town, the final decision being Clarens, after a town in Switzerland where the former President of the Zuid Afrikaansche Republiek, Paul Kruger, had lived in voluntary exile after being forced from the Transvaal by British forces during the South African War. Kruger had been connected with the area in the war against the Basutho people, leading a commando against Chief Moshoeshoe after the deaths of five burghers at the hands of the Basutho. 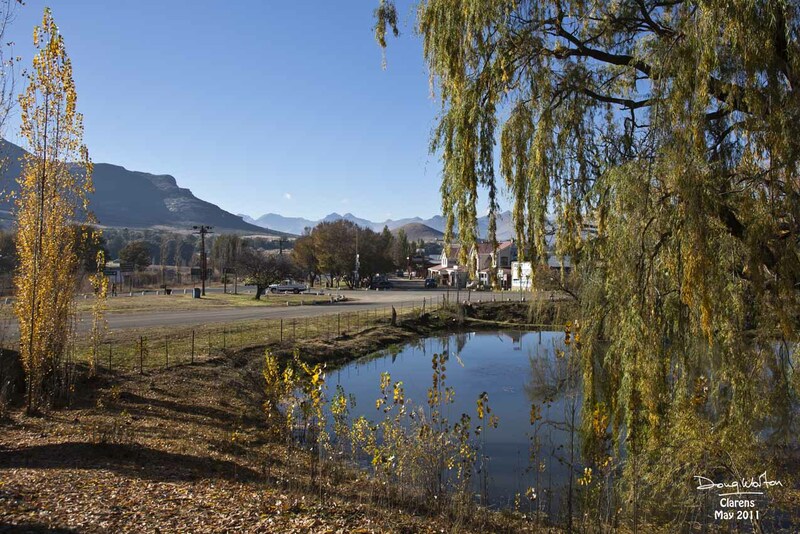 The commando defeated the Basutho at the Battle of Naauwpoortnek in 1866, and a monument to those burghers stands in the square in Clarens today. 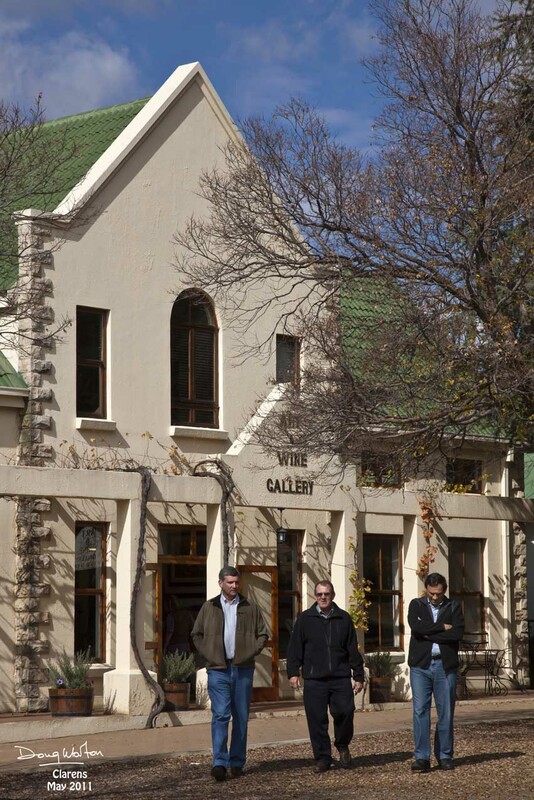 The present-day town began as a centre for the farmers in the region, but changed its character radically some time ago, becoming established as a mecca for artists and art lovers. The typical sleepy atmosphere of such rural hamlets evolved into a busy, lively one, with crowds of visitors invading and swamping the village. The remaining service dealerships and workshops are hardly visible now, and a rash of eateries, boarding establishments, art galleries and tourism operations has sprouted. 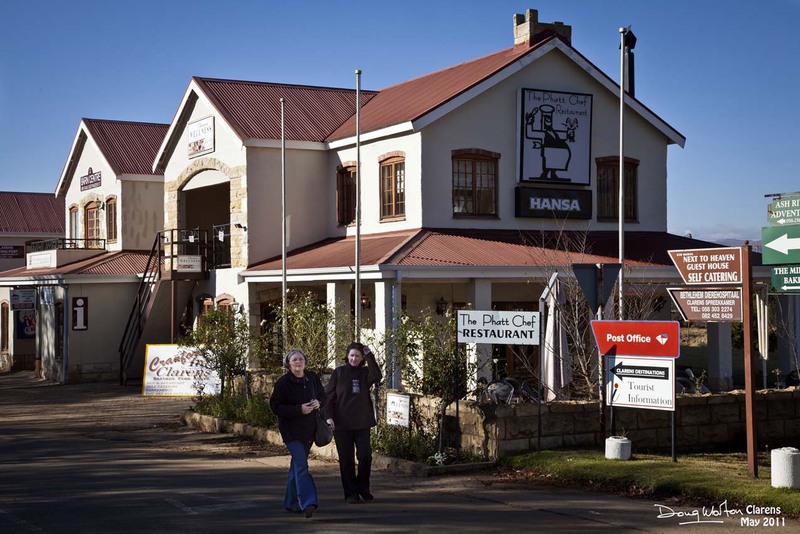 There is a very substantial golf estate, and guest farms offering a great variety of activities and accommodation jostle for space along all three roads leading to and from Clarens. 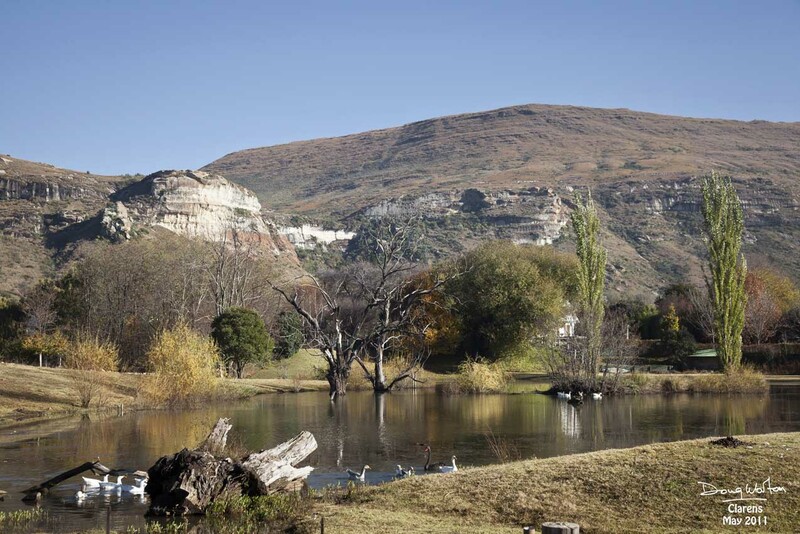 Every scene in this region has a backdrop of dramatic sandstone hills and mountains. How does a team of oxen drag a fully laden wagon through or over that lot? The town itself has an attractive entrance if approached from the Bethlehem or Golden Gate directions, but the first impression from the South is less enchanting. Sadly I didn't record the Southern approach which is beset by sprawling, smoky and nearly treeless townships and chaotic traffic, but the Northern end is colourful and interesting. Accommodation is offered at every turn, and even in between. There are B&B's, boarding houses, guest houses and even a pretty fancy hotel. The names of some of these places are interesting, ranging from stupidly Mediterranean to foolishly exotic to drably mundane and parochial. 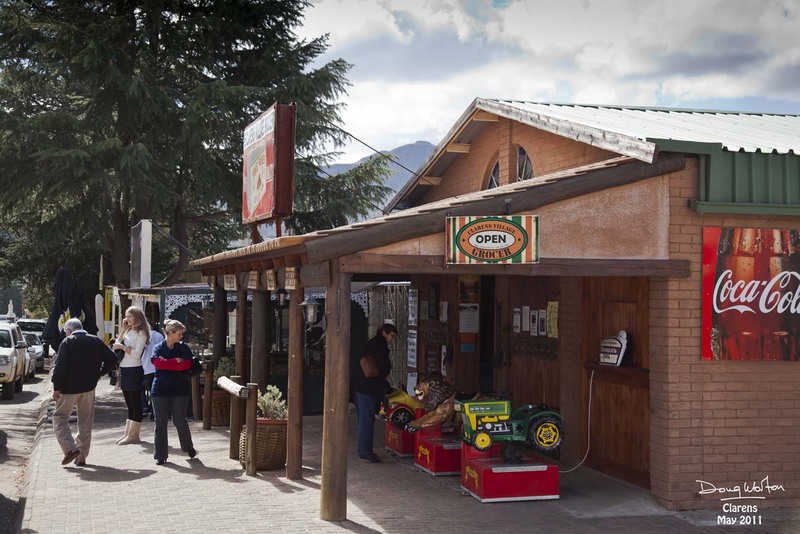 The imposing establishment at the Northern entrance to the town proudly calls itself the Lake Clarens Chalets. 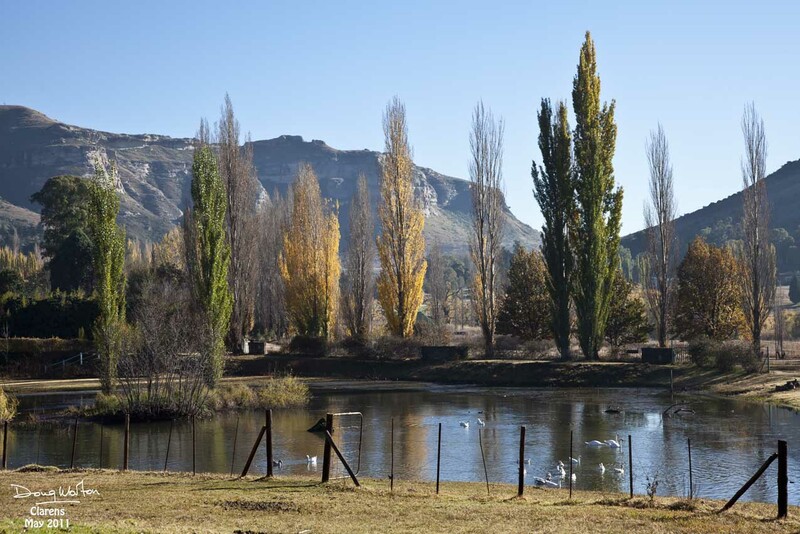 These are not chalets, and the lake, albeit in Clarens, is just a duckpond, and doesn't smell too good most of the time either. Many of the names are patently British, and just a few allude to the background to their setting. I find it sad that a country with so much potential should need to dredge other parts of the world for an identity. But, it's a truly beautiful place, littered wth eating houses and galleries, where the weekend horde can find good food and company away from the stresses of the big cities. 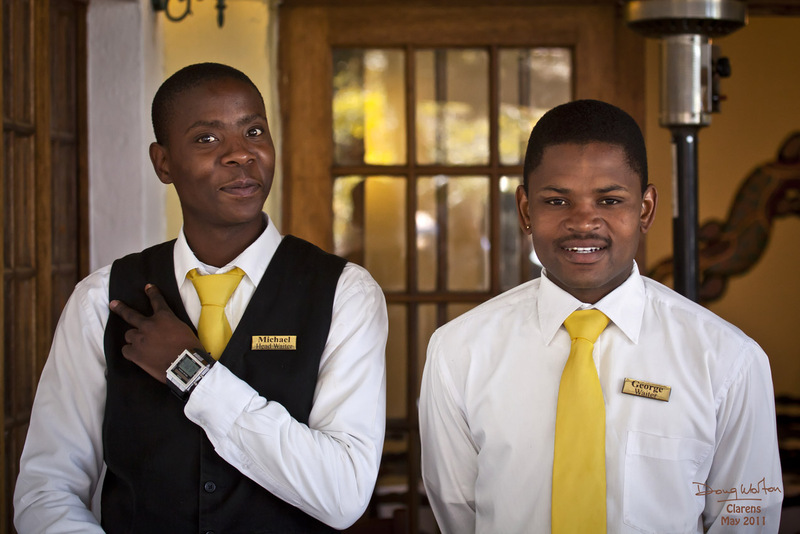 George and Michael of the Lazy Gheko restaurant were typical of the enthusiastic good service all patrons could expect at tables and in shops and galleries. 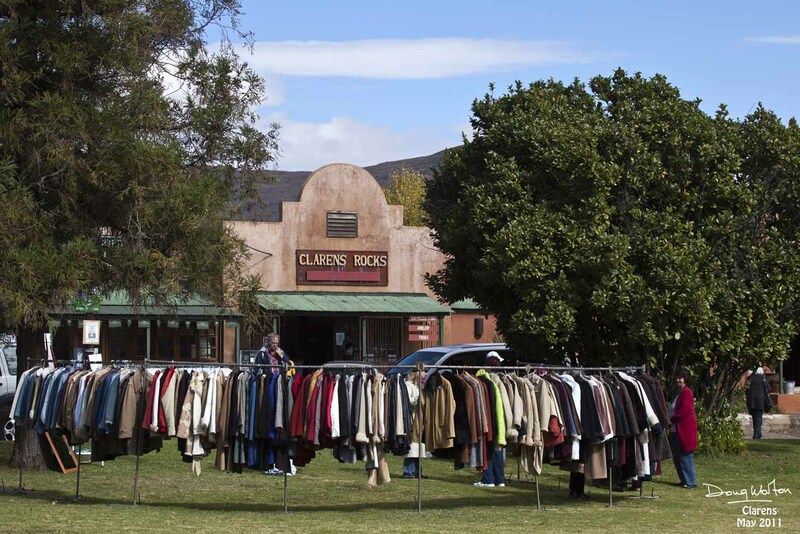 while the serious few go looking for galleries and are to what Clarens owes its new identity. There are some top quality galleries, a number of interesting competitors, and many pretenders. Art is not merely a function of hanging something colourful on a wall, but is a demanding quest for excellence that will attract the customer. This town is rich in diversity of wares, and a mere weekend will never be an adequate opportunity to scout the premises. ...while the less formal vendors ply their wares in the square. 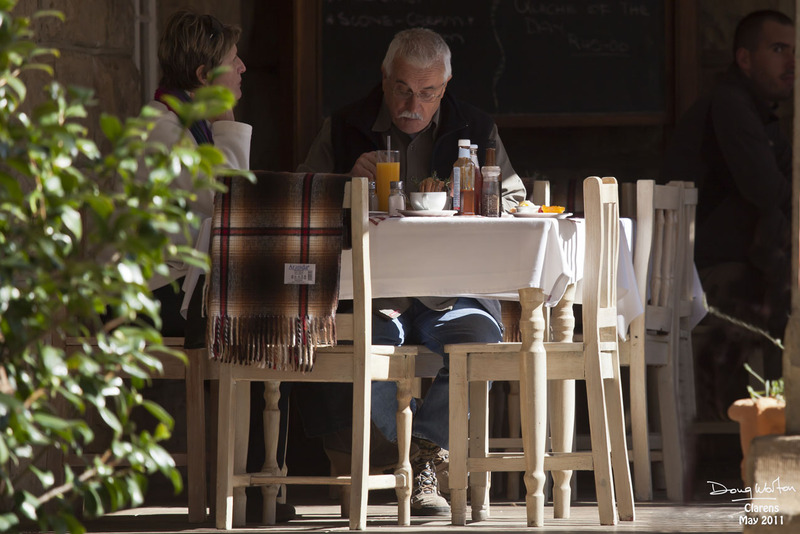 Clarens is an experience that is almost one of a kind. 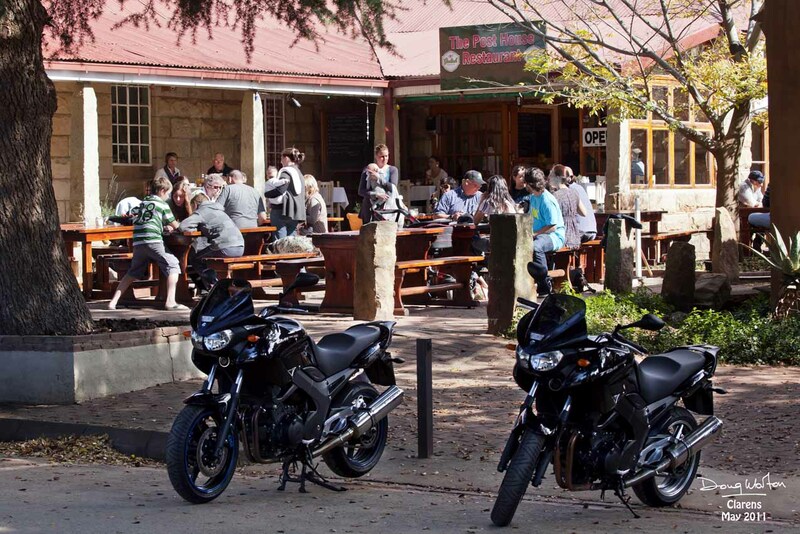 The village has taken on a character that defies logic and attracts the moneyed set from Gauteng, often for the wrong reasons. 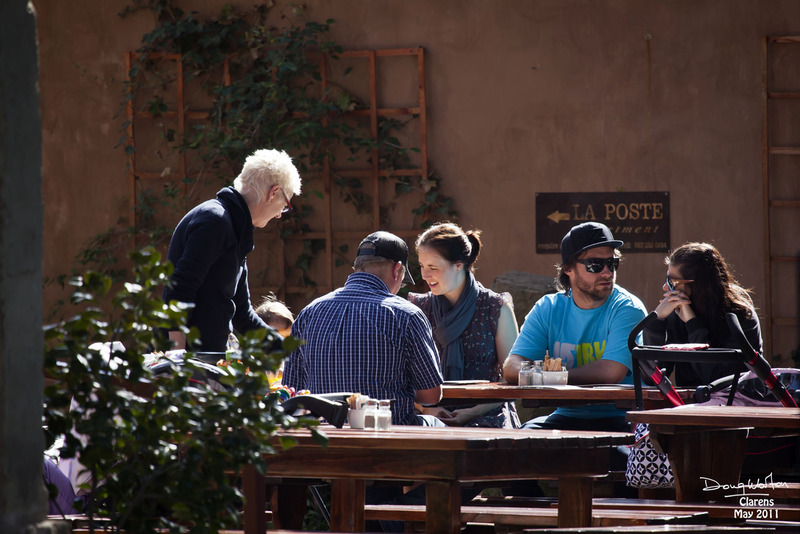 Most of the art business takes place in spite of the visitors, but as a social destination, this town leads the way. 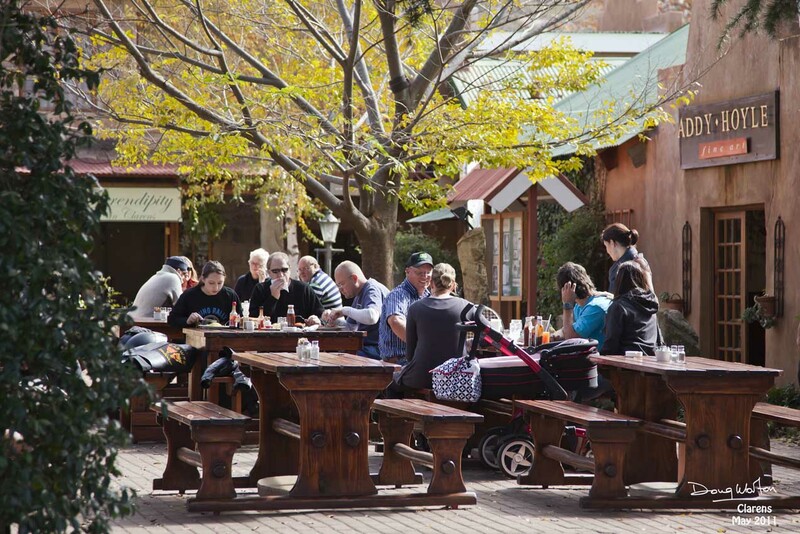 It may not be everyone's ideal getaway, but it has enough of the brash Jo'burg about it not to care. 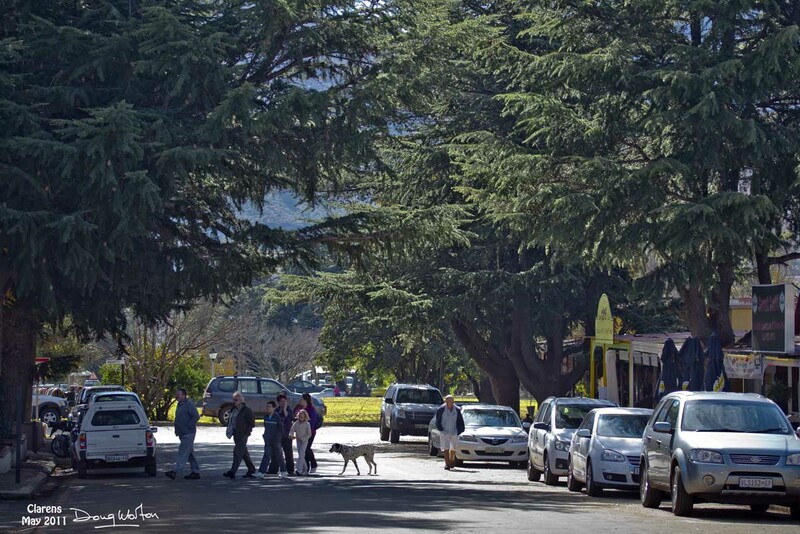 Clarens is Clarens, take it or leave it, and the crowds take it to overflowing. It's a lovely spot full of interest, people, history, scenery and excitement. There's a buzz that doesn't die down, even drowning out the breakfast run motorbikes, the yapping of lapdogs and the squawking of uncontrolled children. There's an energy that cannot be restrained, and above all, there's art. Magnificent, mesmerising art, enough to waken the creative instinct even in an accountant, and engineer or an attorney. And so back to the road and the trip home. 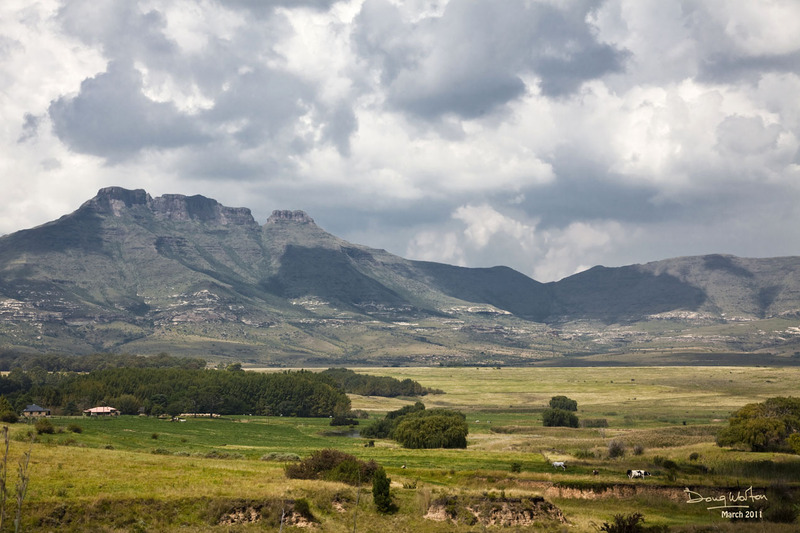 More sandstone hills and cliffs, winding roads in tall grass, a spectacular mountain pass, all ending in the midlands of Kwazulu-Natal which seem dull by comparison. 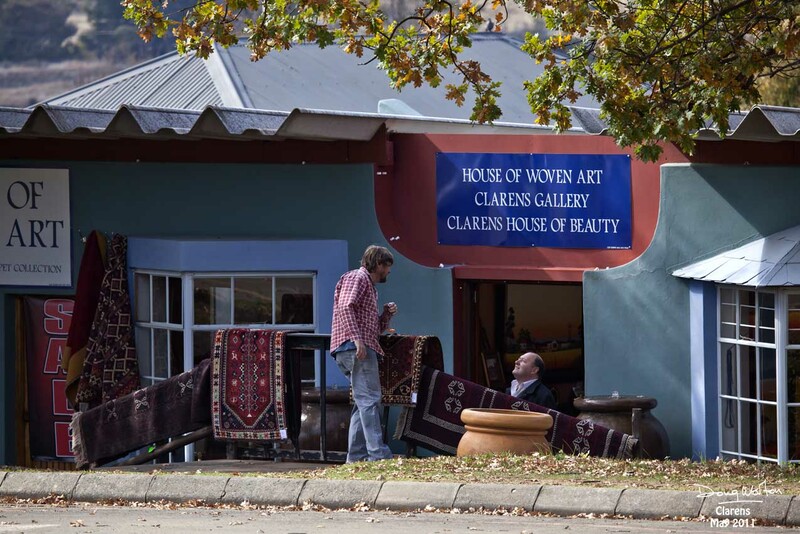 Go to Clarens and experience the latent force, and let me know if I'm wrong. I don't expect too many replies. Utilizing NHL bureau Gary Bettman during the is, he or she had got to observe another jam-packed arena in Nashville having Predators admirers getting the Manhattan faithful solution outnumbered. Set goals that can be specified and a real possibility, then simply break these products down into feasible pieces factor at the moment. In the way, passing each milestone builds confidence and allows energy. Guarantee, thus, evolves like the coral reef on core compresses perfectly into a reliable foundation. I blog quite often and I genuinely thank you for your content. This great article has really peaked my interest. I am going to book mark your website and keep checking for new details about once per week. I opted in for your Feed as well.